A 16-year-old boy has suffered life-changing injuries after he was stabbed outside a restaurant. 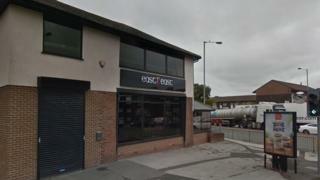 He was injured amid a disturbance between a group of youths outside eastZeast restaurant in Whitefield, Bury, at about 21:55 GMT on Saturday. The boy has been taken to hospital with serious injuries and is in a stable condition, police said. A 16-year-old boy has been arrested on suspicion of violent disorder and remains in custody. Det Insp Andrew Naismith said: "A teenager is now in hospital with injuries that are thought to be life-changing as a result of this incident." The force asked any witnesses to the incident at the restaurant on Bury New Road to contact them as a matter of urgency.